We have just wrapped up the first portion of our Booking Bonus campaign and are very pleased with the results in this trial campaign. Over the next week or so, we&apos;ll be refreshing the look of our landing page, home page, eblast design and other creatives to reflect a more wintery feel for the second portion of the campaign. We are also shifting our focus to the Cariboo/Chilcotin region for this second portion (rather than the lower mainland) and adding in a traditional marketing element. Our focus in messaging will be geared towards pre-Christmas shopping, Arts & Cultural experiences and Christmas experiences (Christmas Train, Wildlights, etc.). Below is a layout of our creative and marketing tactics for the first portion of the campaign. When we break it down even further, our social media and email had the best response with a high click through rate to the booking button. 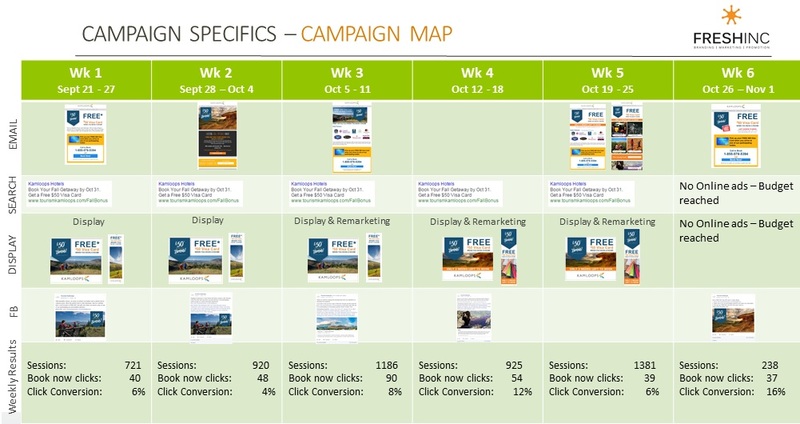 One interesting take away was that although there were more website visits from the Lower Mainland, a majority of bookings actually came from Williams Lake (this is good reinforcement to our decision to move the Winter portion of the campaign to the north). Please go to www.tourismkamloops.com/bookingbonus to find out more.